Beautiful Okinawa lineup with a great crew!! Surfed out and surf looks like another round is comming!! Happy surfing!! searching Okinawa during typhoon opens up all kinds of possibilities! This week we are checking some lesser known places! Enjoy the swell! 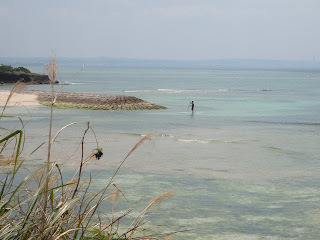 The waves today behind the Happy Surfing Okinawa guest house are none. Flat conditions with strong offshore winds. Keep an eye to the south as some typhoon development is expexted in the next few days!! looks like a great day for a paddle board!! Fun, clean small waves rolling in this am at Kai's peak!! Great day to learn to surf! !